Previous studies demonstrating single digit gender gaps in US party identification have not been able to explain the much larger gap when it comes to US elected officials. But representatives do not emerge from the public at large: they are disproportionately individuals with high education, high occupational prestige, and clear partisan preferences. By estimating the gender composition of this select group by partisanship, we find that the partisan gender gap is much larger among the kinds of citizens who tend to become representatives and that the emergence of this gap was contemporaneous with the historical emergence of a partisan gender gap in the US House. Given the current associations between gender, partisanship, and other attributes among the public, the data suggest that future generational replacement may exacerbate the already significant gap in women’s descriptive representation between the parties, potentially reshaping the behavior of each party’s elected officials, the quality of representation available to diverse members of the public, and opinions of the public toward the Republican and Democratic parties. Translation: if things continue as they are, the gender gap between Democrats and Republicans is likely to get worse — much worse — and it’s already pretty bad. Given how things can shift from year-to-year (or session-to-session), it’s hard to too confident in categorically saying that the Democrats will continue to have more women in their ranks than the Republicans. However, the data certainly seem to point to things not getting better. While my views tend to lean to the liberal side of the spectrum, I’d still like to see more women represented in the Republican party. They are one of the two dominant (only? viable?) parties in the US and if there’s only one party that’s represented by women, that won’t necessarily lead to the best decisions for women or for Americans (and by extension, citizens of the world in general). 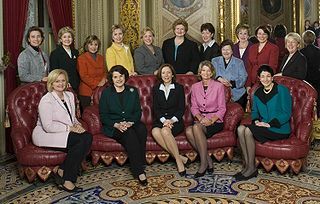 Assuming that Hillary Clinton is able to become the first woman POTUS, I’d be really curious to see the result of a longitudinal study on women in politics. Theoretically, by having a Madam President, there’d be a role model for young women to aspire to. So, I’d want to test the attitudes of young women (pre-teens and teens) every year for the next 20+ years to see if there is an increase in the number of young women who aspire to be Congresswomen, Senators, and maybe even President of the United States! My hypothesis is that there’d be an increase in the desire amongst the people tested, but as the research earlier in this post alluded to, in order for there to be an increase in the number of women in politics, there needs to be an increase in the number of women who are more likely to run for President from that group of people. This entry was posted in History, Politics, Research Blogging, Science and tagged Congress, Gender, Gender Equality, Gender Parity, Gender Stereotypes, Hillary Clinton, Madam President, Madam President Clinton, Miss Representation, POTUS, President Clinton, President of the United States, Research and Politics, Sociology, United States Congress, US Congress, Women, Women in Politics. Bookmark the permalink.